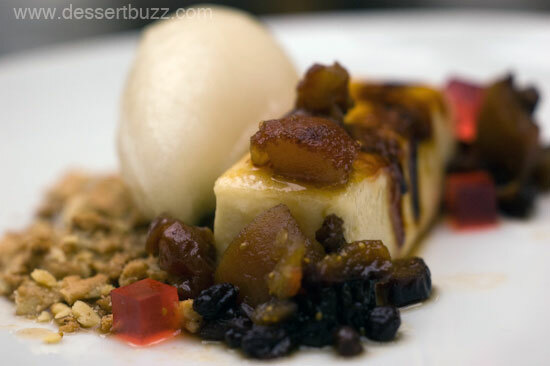 Last Friday I had the pleasure of attending another remarkable lunch with Niko from DessertBuzz. 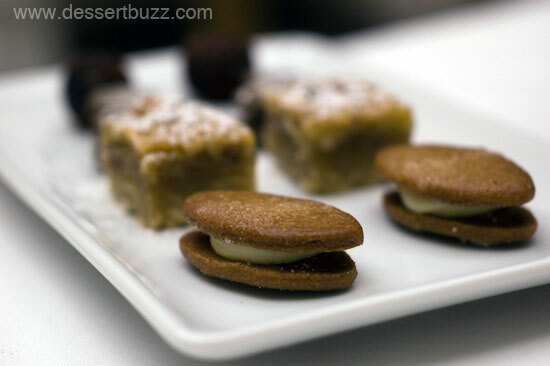 This was the third in an incredible string of dessert tastings over the past three weeks that included Johnny Iuzinni’s fifteen-course blockbuster at Jean Georges and Michael Laskonis’ refined art-like desserts at Le Bernadin. Now, we were in the creative hands of executive chef Galen Zamarra, chef de cuisine David Sturgeon and the rapidly rising star, pastry chef Catrine Oscarson at Mas La Grillade. The savory food at Grillade is wonderful. All the food consisted of simple preparations with balance and rewarding flavors. The calamari stuffed with bay leaf was, perhaps, my favorite example of squid ever. And the burger–on top of a superb homemade English muffin–was incredible. It was also the first indication of the care that goes into the pastry at La Grillade. 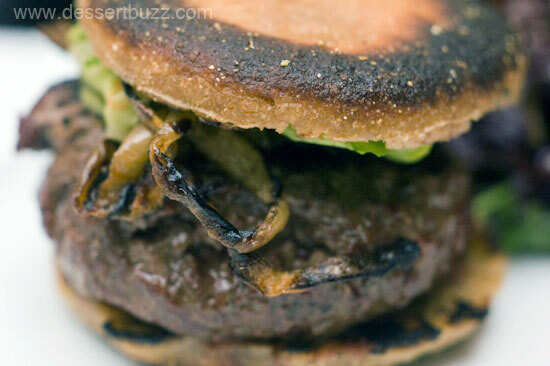 The muffin was perfect for this burger–I’m so glad they chose it over the inexplicably-hyped brioche bun, which is slightly sweet and far too soft to stand up to a burger in any way–not to mention–it gets soggy from the juice of the burger. The muffin was slightly charred, thin and really held its crunch. It was a perfect compliment to the burger, bringing whole grain texture to the beef and leaving a great earthy-ness to the whole dish. I wondered, would Ms. Oscarson’s desserts be this thoughtful? Each of the five desserts we ate at La Grillade had a few things in common including fresh ingredients–no fruit purees, everything is sourced at the greenmarket and the cheeses contain no gums or preservatives. Each dish was a variation on a taste theme , anchored by a fundamental flavor and then nuanced in many directions by different ingredients. 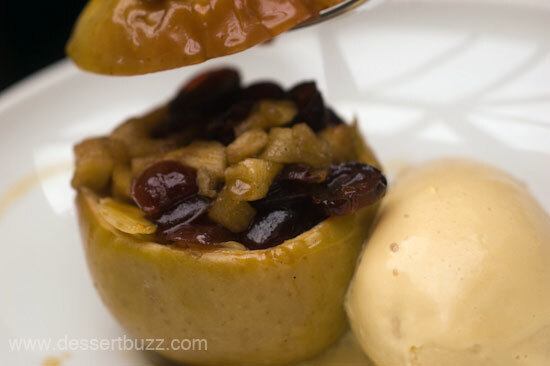 Take the baked stuffed apple. I have never enjoyed a baked apple before. Typically, they are mushy and show little flavor other than the spices added to them. I usually veer as far away as possible (even at Lucas Carton in Paris the baked apple was not to my taste!) 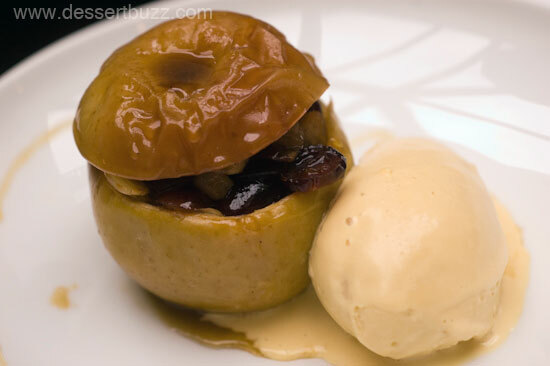 This baked apple, however, was expertly cooked and thought out. It was both firm and delicate at the same time. It tasted like apple, but was perfectly seasoned. The filling of almonds, cranberries, etc. was an extension of all the colors of the apple. The filling and the spices together expanded on, and reinforced the taste of apple. In keeping with the theme of the dish, it was served with cider caramel ice cream with a cider reduction. It was a really a fantastic dessert without any ‘fireworks’ or overwhelming flavors, a completely distinctive dish. 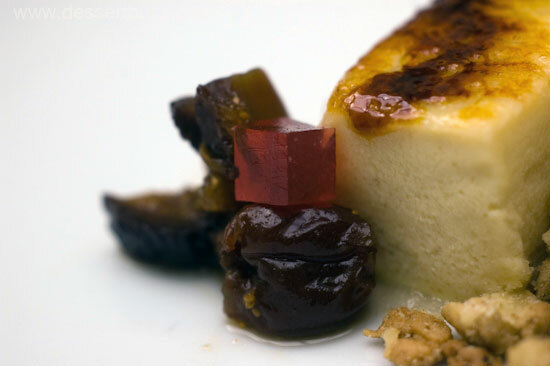 The maple cheesecake brûlée with walnut crumble, pear sorbet and date and fig compote followed the same philosophy as the baked apple. The anchor was a wonderful concentration of earthy flavors that come from maple, fig and date. These flavors paired with cheesecake highlighted the tart and sweet brûlée and pear. The flavors felt related and changed with each bite. The textures in this dessert were its strongest suit. 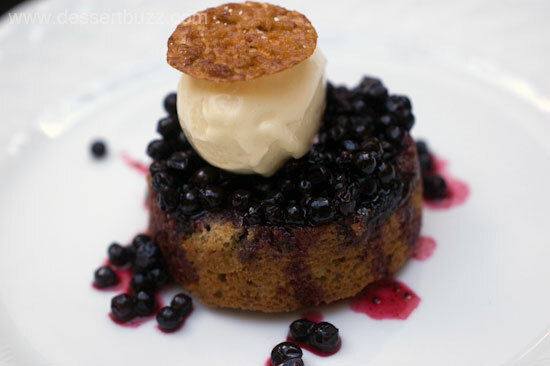 The grilled pear and organic pecan upside-down cake with local honey ice cream and huckleberry compote continued to show off the talent of the chef. The texture of the cake was moist and crumbly and contained soft, velvety grilled pears which, surprisingly, didn’t make the cake soggy. The huckleberry compote on top also, somehow, did not affect the inherent texture of the tart so much as provide an additional texture to enjoy. The whole grains, present in the tart itself–added a nuttiness throughout that went very well with the pairs. The grilled pumpkin-chocolate tart with toasted marshmallow, white chocolate sorbet and candied pumpkin seeds had the most striking and beautiful presentation of the group. 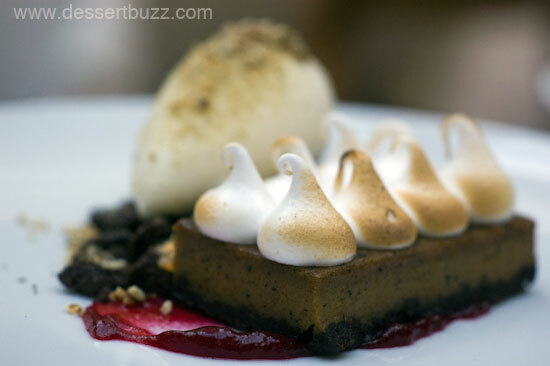 As with the other desserts, there was a theme of flavors but this time with some contrast – the bitterness of dark chocolate and the earthiness of the pumpkin was tempered by the marshmallow (which had been hand-blow-torched). Pumpkin seeds were added to for texture. 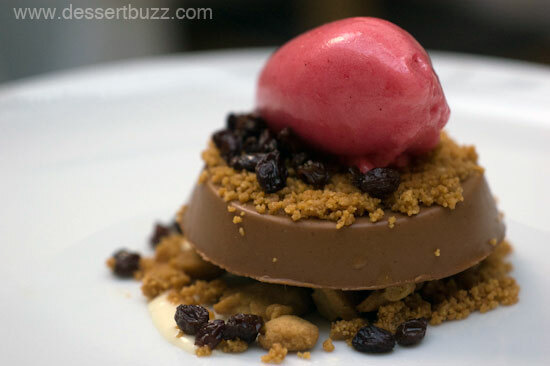 The peanut butter chocolate ganache over whole wheat sablee, red current sorbet and honey creme fraiche was a departure from the other desserts: the flavors acted in contrast as much as in concert with each other. Where the other desserts were like tonal paintings, this was like pop-art. The extreme tartness of the fresh red current (delicious, but may make you pucker!) sorbet brought into focus the deep flavors of the peanut butter and chocolate and made them stand out. The honey creme fraiche acted to buffer these tastes and provide some balance. We both felt that Mas Grillade offered unique and carefully thought out food that left us satisfied in a way that was missing from recent trips to more expensive restaurants. A lunch composed of the grilled squid appetizer, short rib burger with grilled onions and the creme brulee cheese cake is a ridiculously good deal for $28. Mas (La Grillade) recently received a rave and two stars and a full paragraph of praise for the desserts from the New York Times. Mas (La Grillade) is located at 28 7th Avenue South (Leroy) Their website is here. 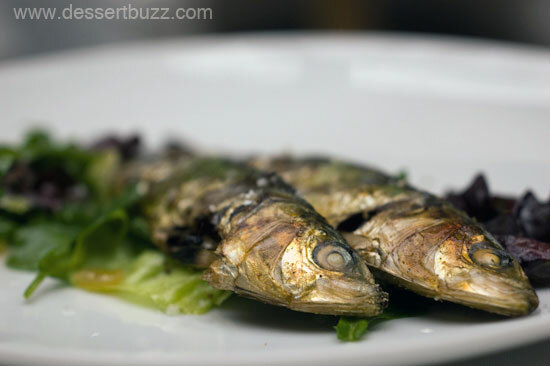 Dessertbuzz has also reviewed La Grillade’s sister restaurant, Mas (Farmhouse). Follow DessertBuzz on Twitter. I can’t wait to go to this place – it sounds fantastic. Beautiful images! I appreciate the descriptions of textures. How the ingredients physically feel in the mouth is a very important part of the experience, and the way they make contact with the tongue can have a huge impact on how the flavors work together in a bite. For that reason, I have to disagree with the author about hamburgers – I personally love a brioche bun, but it must be toasted. I think the soft, sponginess of the bread can actually enhance the flavor of the meat; If the bun is toasted, then it only gets soggy once you bite into the burger – then the bread helps to absorb the juices, extending the flavor on your palate. I find that if a bun is too crusty, I have to hack through it with my teeth to get to the meat. I prefer to take a bite of the whole hamburger assembly and let the flavors play how they will.